Illinois Kite Enthusiasts • Decisions, Decisions...which 1.5 To Get...? Decisions, Decisions...which 1.5 To Get...? I talked a little with Mike about this at our last fly, but I wanted to get any other input folks might have. So basically at some point, I'd like 2 kites that will pretty much cover most of the wind range, but for now, I'd like to get the kite that will allow me to fly most often, given how inconsistent our winds can be around here. Seems those 2 would enable me to fly most any time, no? So, it sounds like I have talked myself into the SUL. Does that sound like the "right" plan, or is there something else I should be considering? Re: Decisions, Decisions...which 1.5 To Get...? You already know I like that plan. The exact terminology in rev-speak is an "SUL 1.5". The SLE is a 1.5 sail with a thick spar, which you don't want. The SUL comes with a 2 wrap spar. The vented B-series come with a 3 wrap and a 4 wrap spar. That would cover everything in my opinion. The b-series really throws a monkey wrench into the works. Personally, if I had it to do all over again, I would own a B-Series Standard and B-Series Vented. I believe that these 2 will cover anything except 0 wind flying. On Thursday, we had little wind to start with but I flew the B-Series standard up until we could go vented in the afternoon. For the really light winds, I use the 2 wrap spar and pulled the knots all the way back to the know closest to the handle. It gave me good lift and control. There is nothing wrong with the SUL though and if you are budget conscious, then the SUL may be the way to go. The only thing I don't like to do is fly it in that in-between range where the wind is too heavy for the SUL but to light for the vented. But that's just me. Mike wrote: The exact terminology in rev-speak is an "SUL 1.5". The SLE is a 1.5 sail with a thick spar, which you don't want. I see...On the Rev site, the SUL was under the SLE link, so I assumed it was called that. When you say "thick" spar, do you mean that it actually has a larger diameter, or just that it's a 3 wrap and not a 2 wrap? 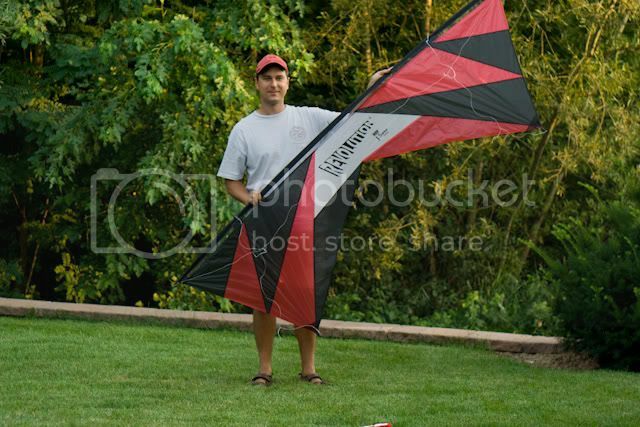 Once I did get both kites, could I use the 2 wrap frame from the SUL in the B-series? The thick spar is the SLE (super leading edge). This spar is larger diameter than the standard 1/4" spar and is included in the 1.5 SLE kite and as an option for the Rev 1. The SLE comes in 3 wrap and 4 wrap combinations. Next you are looking for the most versatility, the standard B-series gives you just that in one complete package. With the two frame sets you can fly the kite in 2(ish) mph winds up to 20+ mph winds very easily. This is not possible with a 1.5 SUL. Use the supplied 2 wrap frame for light wind flying, change to the 3 wrap for normal winds, then add in both leading edges for high wind flying. This kite will work perfectly for you when you finally add in the vented version. One kite will cover the whole wind range. If you purchase the 1.5 SUL you will find that you will also need (want) the standard 1.5 as well for when the wind is stronger than the SUL can handle but not quite strong enough for your Vented. You would need 3 kites but with the b-series you could almost get away with only one kite but will be more than happy with the standard and vented with no gaps in the wind. In the long run this will be less expensive. The standard B-series will cost you about 100 bucks more than the 1.5 SUL BUT you will actually be getting a 1.5 SUL AND a 1.5 SLE in one package which will be about $220.00 less. It's good information. I appreciate it. I guess I was thinking that there wasn't a significant gap between the range of the SUL and the vented-B with 2 wraps. The B is rated down to 5mph with the 3 wrap frame, and I would think that you would get even a smidge lower with 2 wraps. What is the upper limit for an SUL anyway? I'm not terribly concerned with the handles, since I already have some and a 75' line set. And the beginner video isn't necessary. The B-Series standard comes with a 2 wrap and 3 wrap frame and handles. The vented B-series comes with a 3 wrap and 4 wrap and handles. If you get both B-Series, you'll have 2 sets of handles and 2 sets of 3-wrap frames. This is handy, but not the way to go for a budget. Especially if you already have handles. An SUL and a Vented B-Series will get you the same wind-range without duplication. You can put the 3-wrap frame from the Vented-B in the SUL when you want to fly the SUL in heavier wind. Usually as the wind picks up though, I will switch from a SUL with 2-wrap to a Vented with a 2-wrap. Then Vented with 3 wrap, then Vented with 4 wrap. Mike wrote: An SUL and a Vented B-Series will get you the same wind-range without duplication. That's pretty much the way I was looking at it. Maximum mix and match capability once I have both kites. When I win the lottery though, I will be purchasing a standard and vented B-series in each and every color. Jeff I agree with Mike, though keep in mind I have not really flown the B series at all. So my view is a little one sided. Also the sul will handle a pretty good breeze too. As far as the regular 1.5(sle), I would not get that one, the reason being between the sul and the vented you will be able to cover the full wind range. One other thing keep in mind how our winds are around here, either real light or heavy. Not to much in between. That is why I just took my sle and turned it into a vented. I'd say, go with the standard B series. It comes with 2 and 3 wrap spar sets, and from what I've read, the B is only a half ounce more than an SUL. This kite does cost a bit more, but I think it is well worth the extra cost. That being said, I agree with Babbman, that if I were to only own two kites, the Vented and standard B series would be the way to go. Again, I personally like the B-Series for many reasons and when confronted with a choice, will always pull it out over anything else, including my SUL. And, to make things even more difficult, with the new race series of rods coming out, they would take the B-Series down even further in the wind range. Go here and read what a lot more people have had to say about the B-Series. I know that they are comparing it to the SLE but you will get a few more opinions over there than here and maybe some other considerations not presented here. And finally, depending on when you want to get one, you are more than welcome to fly my b-series standard with 2 wrap rods against my SUL to see what feels better to you, for in the end, that's what it comes down too..
And as a final note, if you are going to get a B-series vented in the future, getting a B-series standard will also let you have 2 kites in the same color patterns. I will be impressed when you tell me you have a Backtracker, then I will believe you have ALL of the Revs. For those who have never heard of the Backtracker, it was an entry level kite and the worst Rev ever. Yes, I have one somewhere, Joe gave it to me when I pointed out that I had every other Rev (At the time). It was horrific. Well, not a true "vs" situation. After all, the eventual plan is that I will have both. It's more of a question of which first. I did even think about whether I would want the same colors. But really, I like both designs and wouldn't mind having one of each. I think that the most practical choice for right now is the SUL. I do still have those wonderful Rev 1.0's when the wind picks up more, but I think I will get more mileage out of the light wind kite in the short term. Especially around here. Unfortunately, this is also a period of time where I have to be pinching pennies as much as I can. I told my wife that I was ok to wait until things loosened up a bit, and was feeling a little guilty for indulging in such a luxury. However, she insisted that I go ahead. And honestly, I'm not sure it isn't a necessity. It helps me keep my sanity. And by the way, I'm not ruling out also getting a standard B in the future either. Just not now. Today was a perfect example of why I got the SUL first. Got a little flying in today on the new 120' line set I just made. Barely even enough wind for this little guy. Nice looking kite! I plan on getting an SUL just like that one of these days.